Fox hunting is the sport of mounted riders following a pack of hounds that are hunting a fox by scent. There can be no hunt without a pack. The fox hunt, unlike other types of hunting, is centered on the chase rather than the kill, as the fox is not edible or a threat to man. It is a formal, expensive, and time-consuming activity with a traditional etiquette, uniform, and terminology. In this 1845 advertisement for spring fashion in Philadelphia, riding clothes are modeled with hounds and horses. The riders arrive for the meet in traditional attire—black cap, white shirt and tie, and a coat in the club’s muted color. The huntsman, also in full regalia, arrives and prepares the hounds. With his assistants, the whippers-in, he leaves the meet following the hounds, who have begun their search for a fox. The field falls into line behind the master of foxhounds, sometimes two or three abreast, following club protocol, such as old members before newer ones, and they follow, at a distance, behind the hounds and huntsman. As the hounds pick up speed, the riders move into a trot or gallop, attempting to keep up with the pack, listening all the while for the huntsman’s horn and voice. This procession continues over hill and dale as the hounds search for a fox. If the hounds are successful in unearthing a fox that provides chase, then it is a good day. If no fox is found, or if a fox goes to ground quickly, then the hounds and riders return to the meet disappointed, but full of hope for the next outing. A good deal of the literature about fox hunting has been written by the hunters or by those against the hunt, and these writers cannot help but infuse their work with their own strong perspectives. Toward the end of the twentieth century, scholarship focused less on the history of fox hunting and more on the social role of foxhunting, on the specific clubs, and even on the plight of the fox. 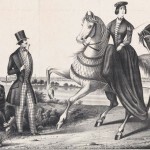 Fox hunting, the sport of mounted riders following a pack of hounds that are hunting a fox by scent, became a popular leisure activity of the emerging gentry in the Philadelphia region during the eighteenth and nineteenth centuries. It survives as a twenty-first-century pastime, even though development has reduced the available countryside, and animal-rights activists have sometimes challenged the practice. Fox hunting was first brought to America in the early eighteenth century by visiting and transplanted English gentry in Maryland and Virginia. In Philadelphia, the Quakers outlawed fox hunting as a “rude” sport in their Great Law of Pennsylvania shortly after settlement in 1682. Even so, there were private hunts in southern New Jersey and southwestern Pennsylvania in the 1700s. As Quaker influence waned, fox hunting, the domain of the eighteenth-century gentry in England, gained popularity in Philadelphia as a leisure activity of the emerging colonial gentry who built grand estates and rode in fine carriages in imitation of their English counterparts. For the late-eighteenth- and early-nineteenth-century gentleman, a pack of foxhounds was as necessary an accoutrement as was a carriage or imported ceramics. In October 1766, twenty-seven Philadelphia professionals, newly successful merchants and lawyers of Philadelphia, founded the Gloucester Fox Hunting Club, the first fox-hunting club in America. On Tuesday and Friday mornings before dawn between October and April, its members crossed the Delaware River by ferry, met for a hearty breakfast, and then hunted red and gray foxes in the forests, swamps, and farmlands of southern New Jersey with a pack bred from English foxhounds. This club was active from 1766 until 1818, except during the 1775–80 war years. There were no organized hunts in the Philadelphia area between the time the Gloucester club disbanded and 1873, but there were a number of private packs. From the 1820s through the 1850s, captains of industry in Philadelphia were among the city men who had become country squires and owned private packs. Owning a large private pack was too costly for some, and so many merged their packs and shared the expense. Beginning in 1859, a pack of trencher-fed hounds was kenneled at the Rose Tree Inn barn during hunting season, returning to their respective homes when the season ended. The Rose Tree Hunt was formed by gentlemen of Delaware and Chester counties in 1873, and over the next decades, a number of hunts sprang up. Radnor Hunt, the oldest continuous hunt club in the Philadelphia region as of 2013, was founded in 1883 with a pack of hounds owned by Quaker Thomas Mather. Lima was founded in 1885, Chester Valley in 1896, Upland in 1900, Brandywine in 1901, White Marsh in 1903, Pickering in 1910, Huntingdon Valley in 1914, and Vicmead, in Delaware, in 1920. It was during this period that women joined the hunt. In fact, ladies rode with the Rose Tree Hunt as early as 1878. In the mid-Victorian era, hunting was considered unseemly for women, and it held real dangers for them owing to the side saddle that modesty prescribed. The invention of the safety skirt in 1875 and the apron skirt in the 1890s, along with the leaping horn and safety stirrup bar modifications for the side saddle, allowed women to participate more safely. Over the course of the twentieth century, land for fox hunting diminished. Post-and-split-rail wood fencing increasingly gave way to wire as farming grew more intensive. The spread of housing developments, highways, shopping centers, and golf courses limited hunting country. Chester County, predominantly farm and pasture, had been ideal for fox hunting with its rolling hills, small copses, creeks and streams, and miles of open fields, much like England, though the new wire fencing made it, too, less and less hunter-friendly. In the first half of the century, Philadelphia continued to be the home of American gentry who indulged, except during the world wars, in elite recreational activities such as cricket, tennis, and fox hunting. After World War II, economic prosperity expanded suburban Philadelphia even farther, encroaching on the hunting grounds, so some clubs leased or purchased large tracts of rural land for private use. In the second half of the century, many of Philadelphia’s hunt clubs closed. The Master of the Foxhounds Association, the governing body of organized hunts, listed 163 in thirty-seven U.S. states and Canada at its website in 2012, the year Pickering and Huntingdon Valley discontinued fox hunting, leaving Radnor as the sole hunt in the Philadelphia area. 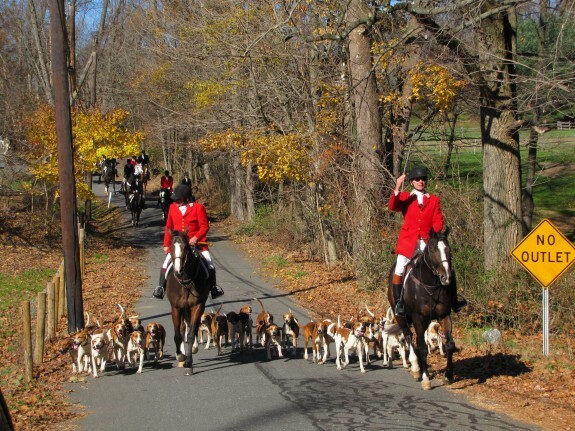 Although fox hunting in Philadelphia has almost disappeared, its vestiges remain strong. 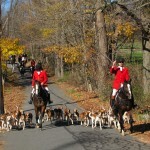 Philadelphia boasts several fox-hunting-inspired events known throughout the equine-minded world. The Bryn Mawr Hound Show, begun in 1914, promotes interest in the hound with shows and breeding information. The Devon Horse Show, begun in 1896 by Main Line fox hunting men, is one of the largest horse shows in America today. The Radnor Hunt Races, begun in 1930, brings together riders to compete in steeplechase racing, with the fences and ditches that a horse and rider would come across in the course of a fox hunt. For all its traditional ritual and attire, the hunt has modernized. In colonial times, the hunt set out from the kennels on horseback before dawn to hunt over common land, and in modern times, it meets on privately-owned land about eleven o’clock with trailered hounds. In the eighteenth century, fox hunting was the pleasurable rural pursuit of gentlemen only, and in the twenty-first century, the hunt includes women, no longer riding sidesaddle, and children. Fans of fox hunting still come out to watch, but these “car hunters” use SUVs and 4x4s rather than carriages or horses to follow the hounds. While there has been some local debate about the state of fox hunting in America, particularly after the success of British environmentalists and animal-rights advocates in banning traditional fox hunting there in 2004, Philadelphians continue to ride to hounds as they have for more than 250 years, continuing traditions imported by the colonists. Doreen Skala holds a master’s degree in history from Rutgers University with a focus in colonial and transatlantic history. Her research has been published as a book chapter and as an article at a British historical society. Higginson, Alexander Henry and Julian Ingersoll Chamberlain. The Hunts of the United States and Canada: Their Masters, Hounds and Histories (Boston: Frank L. Wiles, 1908). Longrigg, Roger. The History of Foxhunting. (New York: Clarkson N. Potter, Inc., 1975). McNeil, Collin. Bright Hunting Morn: The 125th Anniversary of the Radnor Hunt (New York: Derrydale Press, 2009). Milnor, William. Memoirs of The Gloucester Fox Hunting Club: near Philadelphia. Reprint. (New York: Privately Printed by Ernest Gee, 1927). Skala, Doreen. “Fox Hunting and Anglicization in Eighteenth-Century Philadelphia,” in Locating the English Diaspora, 1500–2010, ed. Tanja Bueltmann, David T. Gleeson, Donald M. MacRaild (Liverpool: Liverpool University Press, 2012), 52–66. Thomas, Joseph B. Hounds and Hunting Through the Ages. (Garden City, NY: Garden City Publishing Co., Inc., 1937). Van Urk, J. Blan. The Story of American Fox Hunting (New York: Derrydale Press, 1940). Weigley, Russell F., et al, ed. Philadelphia: A 300-Year History (New York: W.W. Norton & Co., 1982). Devon Horse Show and Country Fair, 23 Dorset Road, Devon, Pa.
Hillman State Park, State Route 18, Hookstown, Pa.
the Huntington Valley Hunt is still an active membership and continues to regularly hunt. It is still a registered hunt with the Masters of Foxhounds of America that was referenced above. Huntington Valley Hunt is still ticking.